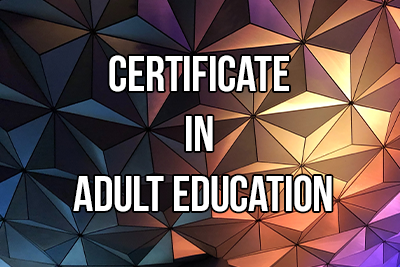 The Certificate in Adult Education program is comprised of four compulsory full credits (40 hours each) and two elective half credits (20 hours each) for total of 5 credits (200 hours online learning in total). The cost for AE104 includes 2 electives. Elective choices are below. Please indicate your choice when you check out or email your course instructor. Note: if you have purchased all of your core courses before, up to and including AE104 and wish to finish by purchasing your electives please proceed here. Adult Education is an immense field that can be divided into dozens of sub-fields. The term “Adult Educator” refers to the individual involved in the teaching, training, skills development and program development of any adult educational environment. Said environment may take place on a university or college campus, in continuing education programs, an adult learning centre, a corporate site, a company board room, or even in someone’s home. As a registered career college in Ontario, this Certificate is a Post-Secondary academic credential. Having a teachers’ college Certificate in Adult Education is a definite asset and may even be a requirement for teaching adults.